Sebastian Gorka, once deputy assistant to President Donald Trump and a counterterrorism adviser, is no longer employed at the White House. Gorka?s history of Islamophobic rhetoric and?thin credentials?as a counterterrorism expert have long solicited?calls?for his ouster, rumors of which?floated for months. TPM?reported in February?on Gorka?s path from ?the anti-Muslim fringe? to the White House. 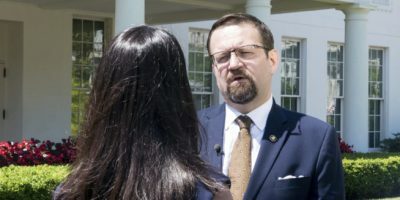 Gorka?told the Associated Press?that he resigned, but an unnamed White House official told a pool reporter Friday night: ?Sebastian Gorka did not resign, but I can confirm he no longer works at the White House.? An unnamed ?source with knowledge of the situation? ?told Yahoo News?that Gorka had resigned, ?but only after being informed on Friday by White House Chief of Staff John Kelly that his security clearance had been revoked, which would have made it impossible for him to continue in his White House job.? Gorka also disputed the White House?s account?to the Washington Examiner?s Sarah Westood. ?How disappointing,? he said of the statement saying he was fired. ?I resigned.? The ouster was cheered by civil rights groups. ?We welcome the resignation of Sebastian Gorka as a presidential adviser,? The Council on American-Islamic relations said in a statement Friday. ?His extremist and Islamophobic views, and his reported past and current associations with racist and anti-Semitic groups, should have disqualified him from any government position.? The Federalist?first broke the news?of Gorka?s ouster, reporting that he resigned ? with no mention of a revoked security clearance ? and printing excerpts of what the publication said was his resignation letter.
? [G]iven recent events, it is clear to me that forces that do not support the MAGA promise are ? for now ? ascendant within the White House,? Gorka wrote. ?As a result, the best and most effective way I can support you, Mr. President, is from outside the People?s House.? The letter criticized Trump?s?speech Monday night?on his strategy regarding the war in Afghanistan because it did not mention ?radical Islamic terrorism,? ?Just as worrying,? the letter continued, ?when discussing our future actions in the region, the speech listed operational objectives without ever defining the strategic victory conditions we are fighting for. This omission should seriously disturb any national security professional, and any American who is unsatisfied with the last 16 years of disastrous policy decisions which have led to thousands of Americans killed and trillions of taxpayer dollars spent in ways that have not brought security or victory.? The Daily Beast?reported in June?that the FBI fired Gorka from the multi-agency ?Joint Terrorism Operations Course? after an August 2016 lecture in which he claimed, in the publication?s words, that ?there is no such thing as mainstream Muslims?only those radicalized and those soon to be radicalized.? Gorka brought attention to himself at an inaugural ball on Jan. 20 when he?wore the medal?and contemporary apparel?of the Hungarian ultranationalist group Vitezi Rend, also called the Order of Vitez. The group?s founder oversaw?the Nazis rounding up, and expelling, hundreds of thousands of Jews during World War II. Gorka?has maintained?that he wears the medal in honor of his father?s fight against Communist rule. Two members of the group?told The Forward in March?that Gorka had pledged lifelong loyalty to the order. But?Gorka denied that. The Forward also reported on a?2007 recording?showing Gorka supportive of the establishment of an militia by the Hungarian ultranationalist party Jobbik. Two years later a judge banned the militia after what the Budapest Times described as ?a series of anti-Roma marches in Tatarszentgyorgy, a village in central Hungary, which later became known for the murder of a Roma man and his young son and other anti-Roma violence.? Gorka?was known by many as a fiery talking head on cable TV shows, who fiercely defended what he?said were President Trump?s beliefs. He often punched above his political weight. ?The idea that Secretary Tillerson is going to discuss military matters is simply nonsensical,? Gorka?said in an interview?earlier this month, though he later claimed to be criticizing the members of the media who asked Tillerson for comment on North Korea. ?A day earlier, he said of Trump?s threatening North Korea in response to the country?s missile tests: ?These are the moments when we have to come together as the nation and support the executive.? In February, he?refused to say?whether Trump believed Islam was a religion and not, in then-National Security Adviser Michael Flynn?s?words, a ?cancer? that ?hides behind being a religion.? Prince William finishes three weeks of work experience as a spy.